This coming July 7-8, 2018, One Defense and QSI Training will host legendary trainers John and Vicki Farnam in Morristown, Minnesota. We have partnered for two courses that will cater to the needs expressed by our students. John will be teaching Armed Response to a Terrorist Attack and Vicki will be teaching Defensive Handgun for Women. We’ve added our popular Multi-Class Discounts again! You can save up to $50 on three classes with our Three-Pack. Our best value is our Five-Pack, which saves up to $150. That’s like getting a free class! Any discounts paid for in 2017 may be used until the end of 2018. I’ve been setting up complex malfunction drills this way for over 20 years and nothing like this has happened before. I’m sharing our experience so others can benefit from it. Based on the number of students and classes we’ve taught I can conservatively say we’ve done this a couple of thousand times without incident. We learned this technique from a very respected and well-known trainer, and have seen it done by many others in classes we’ve attended. This time, however, when the instructor got to Step 7, the gun discharged when he released the slide. His fingers were nowhere near the trigger, and the gun was out of battery. The round went downrange and impacted the berm. We immediately called a cease-fire and had the line re-holster. The instructor handed the gun off to another instructor and then checked himself out for injuries, then another instructor checked him to be sure. Fortunately, all he had was some tattooing on his left arm, likely from unburnt powder from the muzzle (he was wearing short sleeves). If he had not turned the gun sideways with the ejection port facing down, that could have been a lot worse. This is why it is our procedure to always do this while loading and unloading. The arm position has the added benefit of protecting debris from hitting you in the face. We do this because of the potential for accidents while unloading or loading – you don’t want the gas and debris from the ejection port to blow up in your face. Orientation of the instructor’s arms when the round discharged. He was turned “into the gun” and the muzzle was pointed downrange. For safety purposes we are demonstrating this with an Airsoft gun in this photo. Upon further inspection, the gun had clearly fired out of battery. The magazine floorplate was blown off the magazine body was split. We found the shell on the ground, split open, further indicating an out-of-battery detonation. 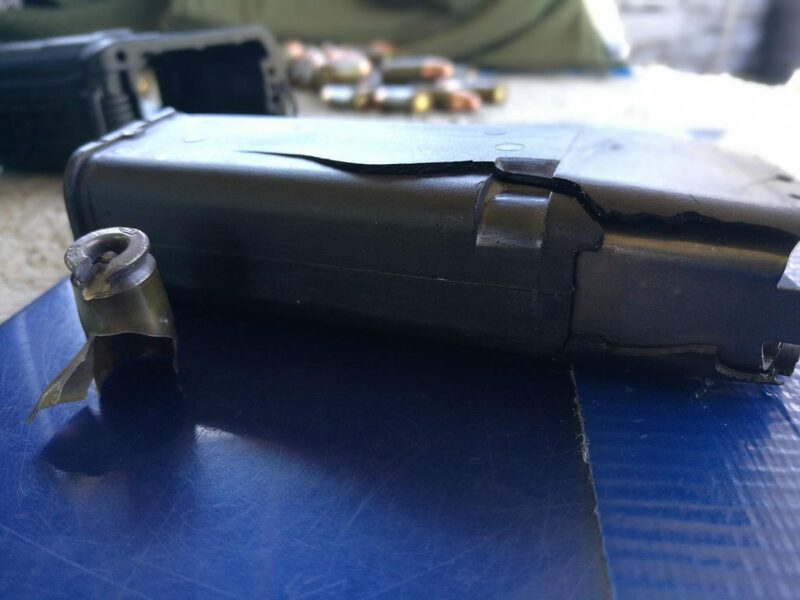 One of our other instructors, who is a Glock armorer, tore down the gun. Most of the lower parts were damaged and will need to be replaced. He wasn’t sure about the frame but thought it should probably be replaced as well. The slide had a lot of tiny debris inside it, including in the breechblock and under the extractor. The barrel looked fine, but of the slide’s internal components were also damaged. It will cost about $200 to fix the gun, assuming the frame is not damaged. We’re not sure exactly what happened. The gun was in good mechanical condition and had no modifications other than an aftermarket slide. We initially suspected that a round had bounced into the ejector, or something like this incident – however, upon closer examination, that does not appear to be the case. 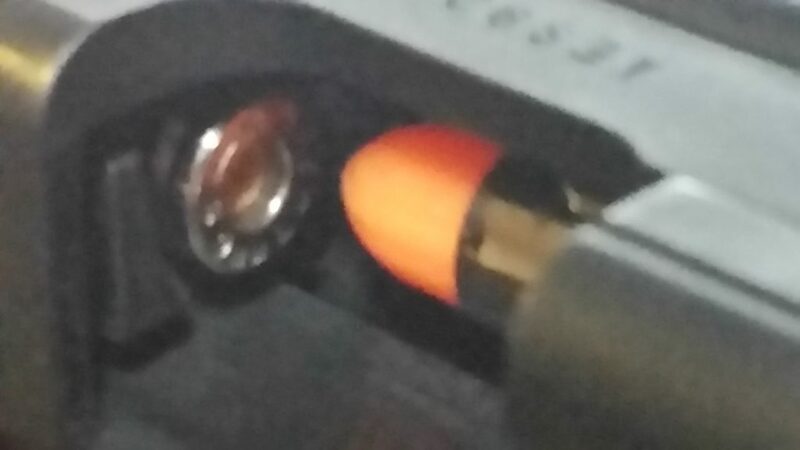 The round went downrange via the barrel, which indicates it was in the chamber when it discharged. 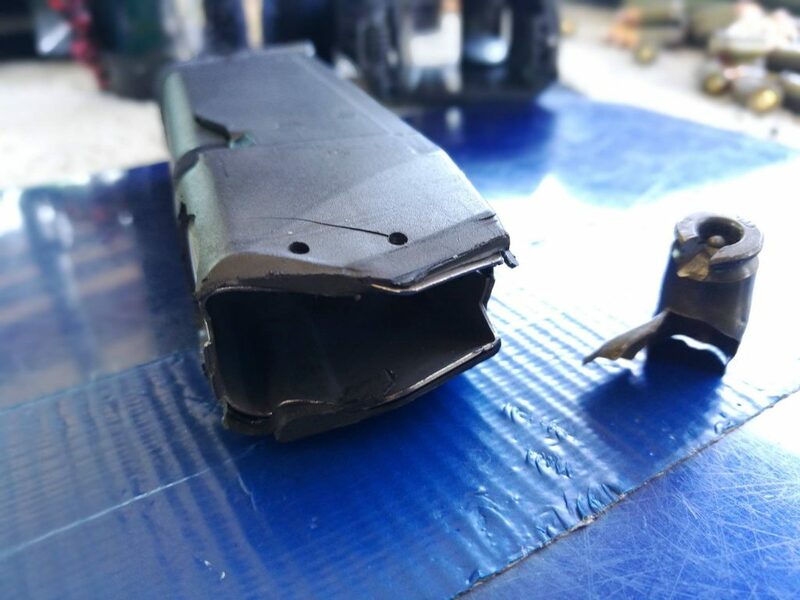 We also could not find any deformation or damage to the gun’s ejector. After being dropped into the chamber, the round slid back and seated its primer against the nose of the top round in the magazine. When the slide was released, the force detonated the round. Regardless of the cause, we’ve decided to change how we do this drill in the future. 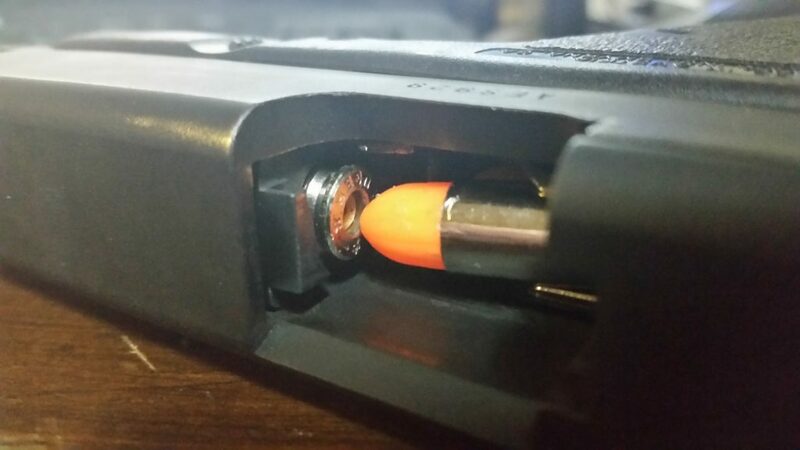 Our solution is pretty simple; we’re going to set up using two dummy rounds at the top of the magazine. Once we got everything back under control at the range we tested this method and it worked great. The lesson reinforced here is clear: No matter who you are, and no matter what you are doing, you must always handle guns carefully and responsibly. We also recommend wearing eye protection whenever handling a gun – even if you aren’t shooting it. We’re glad everyone is OK, and hope that sharing this experience can prevent future incidents. A couple of years ago, I was at a training class out of state. The final exercise of the class was for two people to fight, one as an aggressor and one defending. Both participants were outfitted with protective gear for a full contact fight. One of the observers produced a cell phone and showed a video, confirming that he had indeed said the offending phrase. When you’re stuck in a self-defense situation, you’re going to be under a lot of stress, and natural fight-or-flight instincts can cause you to say (and unfortunately do) stupid things. 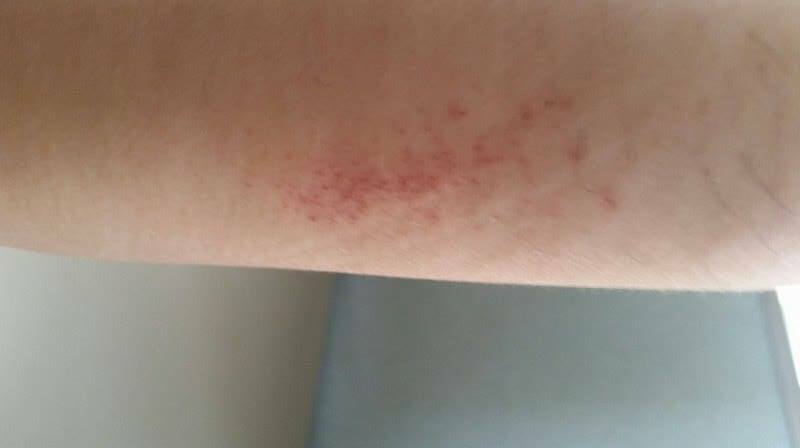 This is why it’s important to develop “muscle memory” and practice proper techniques. It’s also critical to practice proper verbal techniques as well. John Farnam calls this a “Tape Loop” – a short phrase that you memorize and practice to use in an emergency. Tape loops can be used for de-escalating and disengagement; verbal challenges; 911 calls, and even when the cops arrive. These all have some issues from the standpoint of the “ear-witness.” You wouldn’t want any of those phrases attributed to you in court. Even before we get to court, any of these might inspire a bad guy to fight. More likely than not, the bad guy is probably not going to comply with this. And what are you going to do, shoot him if he doesn’t get on the ground? The situation will dictate whether or not you use a verbal challenge at all. It’s not always going to be practical to give a verbal challenge. If events are moving too fast, you might not have time. If you are dealing with an armed bad guy who is actively murdering people, a verbal challenge is probably not going to be effective. The verbal challenge’s purpose is to give the bad guy one last chance to not get shot. Not “hands up”, not “get on the ground”. The bad guy is trying to murder you, and you need him to stop immediately. Telling him to get his hands up is tantamount to giving him permission to murder you. You want him the freeze in place. Once he does that, you can further assess the situation and disengage. If the bad guy stops his attack, the next thing we want to do is identify any weapons and get him to voluntarily disarm. Say this even if you don’t see a weapon – you’d be surprised what comes flying out when you yell it. Any “ear-witnesses” nearby may take note of this as well, and be willing to testify that you saw a weapon, or at least reasonably believed the bad guy had a weapon. When we draw a gun, we are, unfortunately, in the process of becoming a victim of violent crime. In such a situation, it makes sense to call for the police. You aren’t claiming to be a police officer. You’re just calling for the police, the same way that you might yell “FIRE” if you needed the fire department. It’s not illegal to yell “POLICE” when you need the police! Any nearby law enforcement who hear this are going to come running. All things considered, there is certainly very little downside to bystanders and/or the bad guy mistaking you for the police. This may reduce your chances of being attacked by the bad guy or an attempted disarm from a well-meaning citizen. The bad guy may choose to run away, which is an ideal outcome. Despite all this, some folks are not comfortable with that, so if you want to skip it, we’re okay with it. It’s important to think about what you are going to say before you say it. Like any other self-defense skill, your “Tape Loop” needs to be practiced on the range and in scenario-based training.